I think they will look real nice/pro when/if they are coloured in. Well, back onto the standard Futurama style. Just Fry sitting on a stool drinking some Slurm. I have a Leela pic I'm coloring too but these take forever for me to do, so I might have that tomorrow. I drew these yesterday for my son... with his crayon. 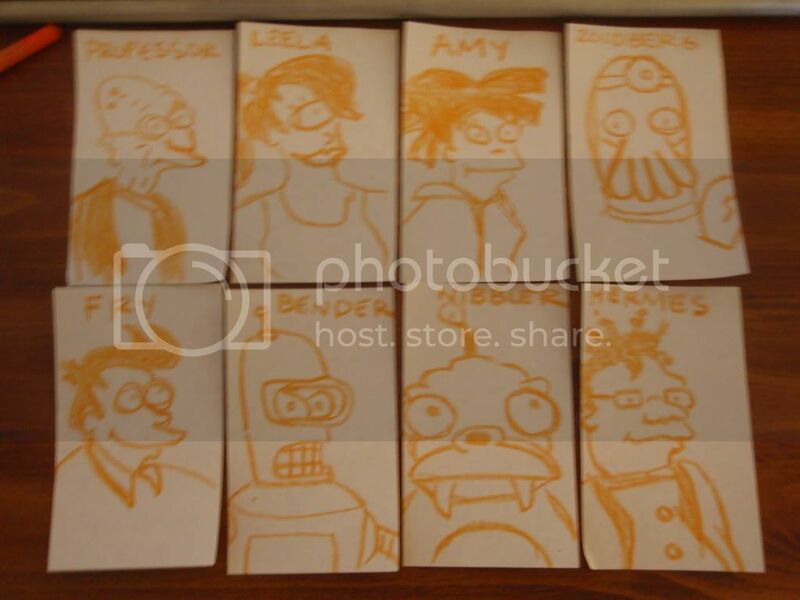 He picked them for me to draw in this order... bender, fry, professor, leela, zoidberg, nibbler, hermes, amy. my son's 3. He picked all the best character's first. He knows what's up. crude i know. I just did it for my baybay! Smarty? You changed your name to 'ice cream angie'? Ahh, my crudely drawn drawing of the return of Futurama. Can't jump on his own? "See, I only broke one ankle"
Well I imagine them jumping at least a few feet. The professor would be lower than the others. So yes, he can't jump on his own. He must use a mechanical crane and a harness.